Matala Weighted Air Hose is a self sinking air hose designed to sink to the bottom of your pond without additional weight. 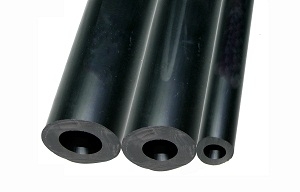 It is available in 3 sizes; 3/8", 5/8" and 1.0". The black color easily disguises it on the pond bottom. You may purchase it in 10 foot increments or 100 foot rolls. The 1.0" is available in 50 ft rolls. Below is a table showing the recommended hose sizes for our Hakko Air Pump products. * The outlet on the Hk 120L is 1.0". Do not use smaller hose than 1.0" for the HK 120L. It requires this size hose in order to run cool. If you use a heavy duty 4 way manifold with the HK120L, you can use four 3/8" hose to deliver air to 4 diffusers. See the article Heat Control for Hakko.